We are into our rehearsals for Design for Living, and I am working like a dog to get my lines down as early as possible. So far I’m doing well, I think. Sadly, as does often occur, one of our cast members has pulled out of the show. I’m not aware of the circumstances other than they are personal, so we were breaking in a new cast member on Monday night just gone. It’ll be interesting as I think we are both hetero (I at least know I am 🙂 ) playing bi men. Oh! Did I mention that before? Well yeah, if you are not familiar with Noel Coward’s comedy about sexuality and relationships, then I’ll let you know it focuses around two bi-sexual men and their relationship with a certain lady. So now you know. Oh, don’t worry. There’s nothing overt or gratuitous about the whole deal. 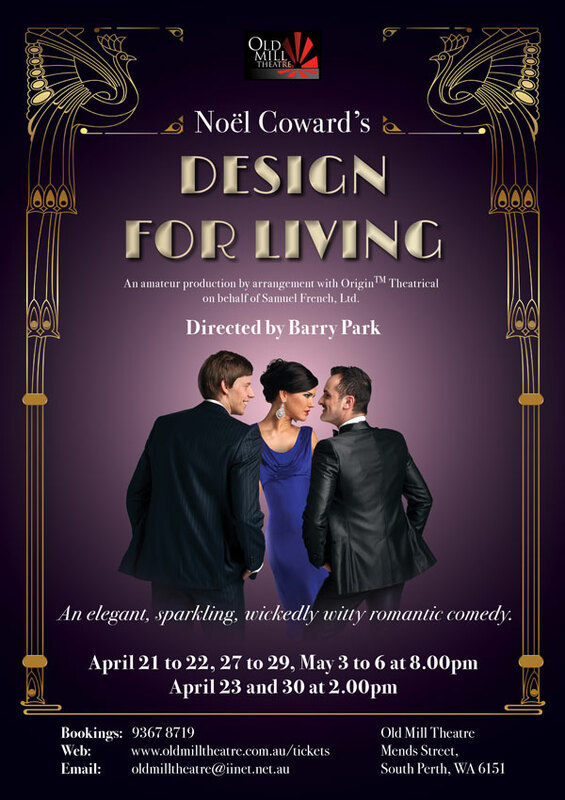 In typical Noel Coward style, it is all very refined, restrained, and hilarious. I’ve not before played a role that challenged my sexuality preferences, but I am intrigued to see how it pans out. So far, I am personally amazed at how easily I have taken it all. Tickets are on sale via the Old Mill website. EDIT UPDATE: We are back to looking for a new Leo. Our replacement has also withdrawn… Putting out the call.